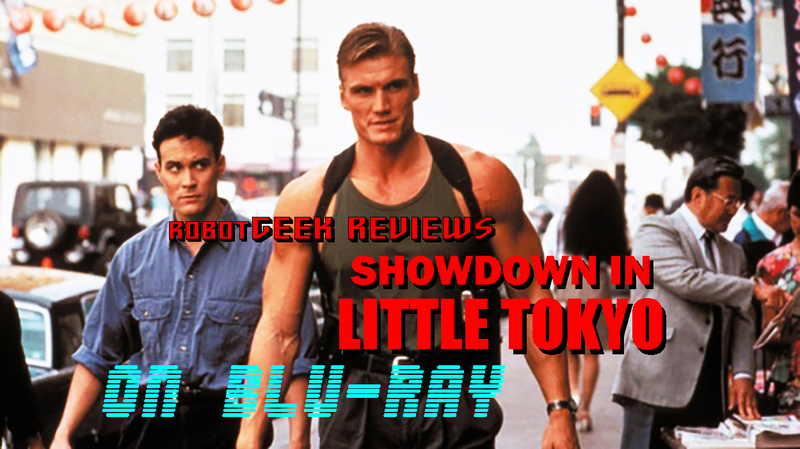 Growing up an action fan all of my life, of course Showdown in Little Tokyo was right up my alley. 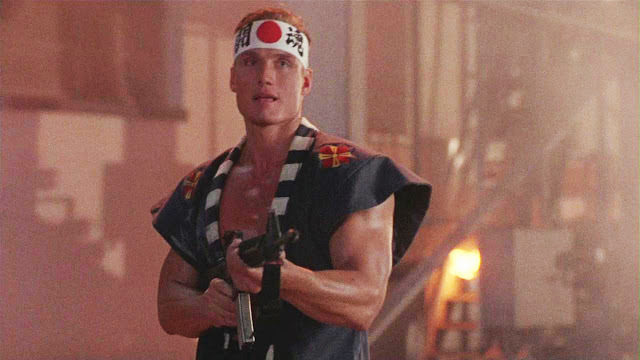 While I had not yet learned just how awesome Brandon Lee was at that time, I certainly knew who Dolph Lundgren was, and better yet, director Mark L. Lester. After all, he is the man who helped make Arnold a box office star having directed him in Commando. And really, I think it was just knowing that Lester directed this was the main attraction for me. Well, that and Dolph starring in it. I can honestly say I wore out my VHS of this excellent film through many, many repeated viewings and when I eventually upgraded to DVD, I was sad to see that it was still in full frame. Thanks to Warner Archive's new Blu-Ray, they finally fixed that issue. In fact, as far as I'm aware, this Blu-Ray transfer is the very first time being able to see this film in the U.S. in widescreen. Not sure about the other regions, but I know here it's never been available in it's original aspect ratio, so this is sort of a big deal. While I was on the fence about upgrading to Blu-Ray for a while, I finally did thanks to the urging of my friend and Dolph Lundgren expert Jeremie Damosaeu, author of the book The Punisher: The Secret History. All I can say is I'm so glad I did. Let's dig in. It's no secret that I love this movie, or that it just flat out rules. Released in 1991, it's remained a cult classic and an important entry within the realms of Badass Cinema. Additionally, it's one of the best examples of the cop/buddy action formula, and by giving it a very distinct Asian angle, sets itself apart from the flood of similar films flooding the market around that time. Brandon Lee and Dolph Lundgren's undeniable chemistry is what makes this one so special, playing off each other in such a natural way that it's a true shame these two never got the chance to possibly make more films together, whether it be direct sequels to this film or other projects. I recently had a birthday, where I turned 42. So you can imagine I was pretty much just the right age to enjoy this film when it first came out, being around 15 years old. I don't like to celebrate my birthday anymore but I do use it as an opportunity to do something for myself, and on this birthday all I wanted to do was pop in this new blu-ray and enjoy some nostalgia. And a funny thing happened, I had a grin a mile wide and felt like that 15 year old kid again. I just couldn't stop smiling because despite nearly 30 years, Showdown in Little Tokyo hasn't lost it's edge, ability to entertain, and most importantly, it's "cool" factor. Sure you could easily pick this film apart, because anyone who doesn't love action films easily could, but despite it's flaws, Showdown beat the odds and became a certified cult classic, and it's audience is still growing. Warner Archive released this film in 2015 on Blu-Ray for the very first time in HD and most importantly, in widescreen. While the film has been released countless times on DVD in it's single snapcase edition or as part of a film pack, it was always in the dreaded full frame. You couldn't even find it in widescreen on Laserdisc, which is sometimes the go-to route for these under-the-radar classics in their original aspect ratio. So for you purists out there, this purchase is a must. Now that I think about it, this reminds me a lot of another martial arts cult classic that had a similar release, the 1991 Jeff Speakman classic The Perfect Weapon, released by Olive Films on Blu-Ray in 2012. 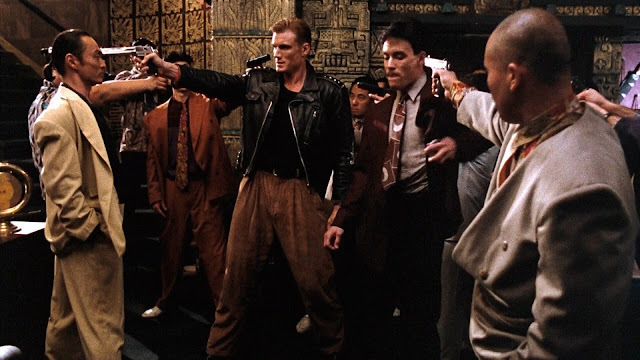 Just like Showdown, The Perfect Weapon was another martial arts action film released in 1991 and gained a huge following within that very specific martial arts/action genre, back in the early 90's where it was at it's peak. 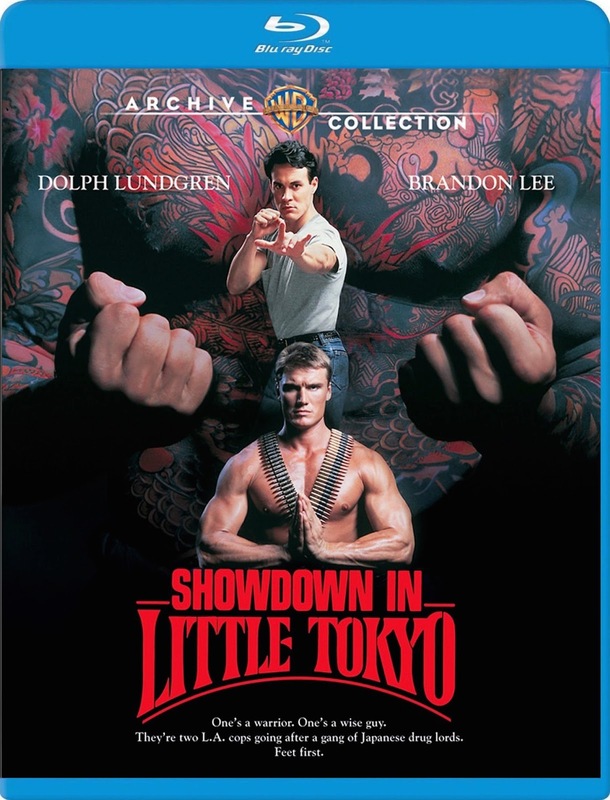 And just like Showdown, Weapon was never released in widescreen on any format until it's 2012 Blu-Ray release. In terms of the transfer, let me just say it's damn impressive in it's new 2K restoration. We have to remember that this was in a time when films were shot on actual film, in analog, and unlike films shot on digital camera's and released on Blu-Ray, these older films will always have a slight graininess to them, because that was one of the beauty of shooting on film. It looked and felt organic and by preserving it in glorious HD, it's given new life while also being preserved forever. The bright neon colors of the early 90's, mixed with the traditional bold colors associated with yakuza films are put on display in a confident and impressive 1080p image. The original aspect ratio of 1.85:1 has been changed to a 1.78:1, which isn't a huge difference, but still in widescreen and leaps and bounds better than any previous release in terms of aspect ratio and picture quality. And that's really where the praise ends because that's all we have here. Just like all of their other releases, there are no Special Features to import from previous releases because there were none, and they do not make it a habit of producing new ones for upcoming releases, which is both sad and frustrating. I'd love to hear from Dolph and director Mark L. Lester about their memories making this film, it's impact on the action genre, and their memories regarding Brandon Lee. It's a shame nothing in terms of new interviews, behind the scenes stuff and any form of supplemental material has ever been done regarding this film. It might take a re-release someday down the line by a studio like Shout! Factory to get anything new like that. One can only hope. If you love this film already (who doesn't?! ), or were curious about it but have never seen it, this new Blu-Ray is a must buy. There's no question about that. It easily stands as both one of the best films ever made in the martial arts/action and cop/buddy genre's, as well as a high point in the career's of both Dolph Lundgren and Brandon Lee (marking this as his first U.S. film) and even director Mark L. Lester, who's give us some killer gems just as much as he's given us some pretty forgettable films. But we could take comfort in knowing that his work throughout the 80's and early 90's are his best, where he gave us some true classics, whether it be big budget studio films or under-the-radar cult films, and Showdown in Little Tokyo is arguably one of not only his best, but one of the best period.